Jesse and Mary were enumerated in the 1850 Union Co., SC, federal census. He was a blacksmith, age 32, she was 29. Children in the household were Mary Ann 9, Wallace 4, Murphy 2, and Unity 4 months. Jesse and Mary were enumerated in the 1870 Bogansville, Union Co., SC, federal census. He was a farmer, age 52, she was 50. Children in the household were Madilla 18, Julia 15, Henrietta 11, and President 9. Jesse and Mary were enumerated in the 1880 Bogansville, Union Co., SC, federal census. He was a farmer, age 63, she was 60. Children in the household were Madella 28, Julia 25, Henrietta 21, and Jesse P. 18, all born in SC. Mary Ann Holcombe was born circa 1840 at SC.1 She was the daughter of Jesse Holcombe and Mary Lawson.1 Mary Ann Holcombe married Frank Briggs. Wallace Holcombe was born circa 1845 at SC.1 He was the son of Jesse Holcombe and Mary Lawson.1 Wallace Holcombe died; in Civil War. Unity Madella Holcombe also went by the name of Della Holcombe. She was born circa February 1850 at SC.1 She was the daughter of Jesse Holcombe and Mary Lawson.1 Unity Madella Holcombe married A. G. Bentley. Unity Madella Holcombe died in 1940. A. G. Bentley married Unity Madella Holcombe, daughter of Jesse Holcombe and Mary Lawson. Henrietta Cornelia Holcombe was born circa 1858 at SC.1 She was the daughter of Jesse Holcombe and Mary Lawson.1 Henrietta Cornelia Holcombe married James Eubanks. Jesse President Holcombe was born in 1861 at SC.1 He was the son of Jesse Holcombe and Mary Lawson.1 Jesse President Holcombe married Rachel Ann Young. Jesse President Holcombe died in 1931. Frank Briggs married Mary Ann Holcombe, daughter of Jesse Holcombe and Mary Lawson. Rachel Ann Young married Jesse President Holcombe, son of Jesse Holcombe and Mary Lawson. James Eubanks married Henrietta Cornelia Holcombe, daughter of Jesse Holcombe and Mary Lawson. Juanita Miles was born on 15 March 1921. She married James Alfred Curtis Jr., DDS, son of James Alfred Curtis and Mary Holcombe, on 14 February 1947. May Curtis was born in 1880. She was the daughter of James Alfred Curtis and Mary Holcombe. Perry was an Ashtabula businessman for 30 years. He died at the home of his brothere Norris. He owned an doperated a restaruant and pool room on Main Ave. He also managed a ball club, the Stevens' Braves. He played professional baseball in Sioux City, Iowa, in the central League. Timothy W. and Orpha C. were enumerated in the 1930 Ashtabula, Ashtabula Co., OH, federal census. He was a blacksmith, age 45, she was 43. There were no children in the household. Adopted Son. H. Rolland Stevens, age 17, and mother Addie A. Stevens, 76 were also in the household. Timothy worked as a blacksmith after working on the Pennsylvania Railroad Roundhouse and the Ashtabula and Buffalo docks. Served as a city councilman from 1931 - 1936. His hobby was gardening and he has over 1/2 acre in garden. Greenlief Holcombe was the son of Caleb Holcombe and Abigail Norris. 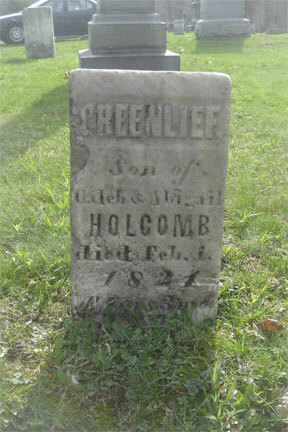 Greenlief Holcombe died on 1 February 1824. [S137] Elisha Scott Loomis, Joseph Loomis, page 386. Charles and Cordelia were enumerated in the 1910 West Hartford, Hartford Co., CT, federal census. He was 49, she was 49. The only child in the houehold was Elizabeth, 11. [S137] Elisha Scott Loomis, Joseph Loomis, page 517. Burdett and Jane were enumerated in the 1910 West Hartford, Hartford Co., CT, federal census. He was a manager at an electric company, age 38, she was 36. Children in the household were Butler I. 11, and Mary L. 8. [S137] Elisha Scott Loomis, Joseph Loomis, pages 386, 517. Children of Jane Ives and Burdett Loomis Jr.
Butler Ives married Elizabeth Miller. Elizabeth Miller married Butler Ives. Isaac Glazier married Clara Safford Mather. Clara Safford Mather married Isaac Glazier. "Edward" and Frances were enumerated in the 1900 Powhatan, Pochaontas Co., IA, federal census. He was a farmer, age 45(sic) born Mar 1845, she was 49. Children in the household were Bernice R. 15, Joe L. 8, and Vivian D 4. Edwin R. and Francis F. were enumerated in the 1930 Marmaton, Allen Co., KS federal census. He was 75, she was 68. They were living next door to son Job L. and family. Edwin Ryland Trites was born on 27 March 1855 at DeWitt, Clinton Co., IA.1 He married Frances Flora Holcombe, daughter of Warren Jarvis Holcombe and Sarah Elizabeth Bass, on 25 April 1881 at DeWitt, Clinton Co., IA. Edwin Ryland Trites died on 3 October 1934 at Moran, Allen Co., KS, at age 791, and was buried at Moran Cemetery, Moran, Allen Co., KS. Edwin Lewis Trites died on 10 August 1883. He was born on 10 August 1883. He was the son of Edwin Ryland Trites and Frances Flora Holcombe. Ennis and Bernice were enumerated in the 1930 Hopewell, Hayes Co., NE, federal census. He was a farmer age 46, she was 45. Children in the household were Leonard E. 23, Della L. 15, Dallas 13, Verdia 10, and Dennis L. 3 years 7 months. Also in the household was Harold R. Howell, age 29, son-in-law, and Ruth d. Howell, 19, daughter of Ennis and Bernice. Job and Nellie were enumerated in the 1930 Marmaton, Allen Co., KS, federal census. He was a farmer, age 38, she was 35. Children in the household were Billie 12, and Edwin 9. Enumerated next door was father Edwin R. and mother Francis F.
[S182] Social Security Death Index (on-line), Ancestry.com, SSDI, Ancestry.com, SSAN 513-10-3030. [S182] Social Security Death Index (on-line), Ancestry.com, SSDI, Ancestry.com, SSAN 510-68-2008.